The Watson family has business roots in Saginaw dating back to the 1920s. Richard T. Watson and his young family, including Burton T. Watson, began distributing milk in the Saginaw area during the Great Depression. The business evolved into producing ice cream, and the Watson family operated a popular soda fountain in the City of Saginaw, a common place for friends and family to gather. Eventually, they became one of the largest producers of ice cream in the state of Michigan. After World War II, they added the popsicle franchise to their business. They produced and delivered all of the frozen novelties consumed in northern Michigan. Burt sold Watson Dairy and purchased Timmons Motor Sales on December 31, 1955. The dealership in those days was located further down on Midland Road. At that time, the dealership was also a standard gasoline station (having just a few employees). Upon purchasing the business, the pumps were quickly removed to focus efforts on the selling and servicing of new and used vehicles. Burt built the present dealership in 1969. It is 35,000 square feet (sq. ft.) with roughly seven acres of blacktop and an additional 1,500 sq. ft. in the used vehicle building. Burt’s son Richard joined the business in 1976 after attending the University of Michigan. Upon his father’s passing in 1979, Richard became the dealer and continues on in that capacity today. During Richard Watson III’s tenure, the dealership grew to be a leader in Chevrolet and Pontiac sales. In addition, Richard provided community leadership in many areas. He served on the board of directors for both Saginaw General Hospital and Saginaw Community Hospital. In addition, Richard Watson III was a founding member of both the 1st State Bank of Saginaw and Bay City and the One Hundred Club of Saginaw County. Mr. Watson and his longtime friend Mr. Gary Bivins also developed Thomas Farms Estate, as well as other smaller subdivisions. Mr. Watson and his friends always had a vision of improving our community. 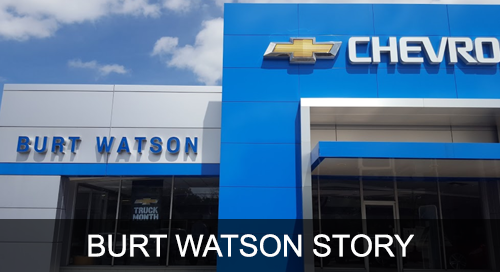 In 2018, Richard Watson the IV (pictured with Mr. John W. Spreeman, General Manager) began his dream of becoming the third Watson to lead Burt Watson Chevrolet, Inc. Currently, Burt Watson Chevrolet has 77 employees from the Great Lakes Bay Region’s local communities. We have 16 retirees and 17 employees with greater than 20 years with the company. Mick McMillian has 43 years and Dan Davis has 31 years, respectively. Over the last 10 years, Burt Watson has expanded and upgraded its campus by investing five million dollars in the infrastructure. Our latest investment happened in December 2014. The dealership purchased an additional 2.5 acres and built the 11,000 sq.-ft. Service Facility II. The purchase of this expansion allowed us the space to improve our ability to provide for our growing customer base. You know us for our great sales efforts as reflected in our five straight Chevrolet Mark of Excellence achievements. Now you know us for our longstanding traditions and desire to improve all aspects of the communities we live in by being a leader in customer service and employee development. Now that is It's a Burt Thing!